When is the best time to plant garlic? : Typically plant in mid-October (around Columbus Day) for harvesting in mid to late July (in warmer climates you can get away with planting as late as December). Favorite varieties? : Spanish Roja (beautiful reddish-purple skin falls right off), Pskem (four huge cloves), German Hardy (bulletproof standby). Any favorite garlic suppliers? : Find a local festival for the best prices and regionally adapted varieties. The Garlic Store out of Ft. Collins, Colo., has a nice selection but is pricey. How much garlic do you plant each year? 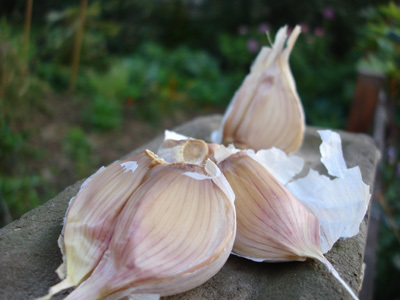 : I’ve planted anywhere from a small garden patch anywhere up to 70 pounds of seed garlic. One pound generally equates to 20 to 40 row feet, depending on the variety. How do you store your garlic? : After harvesting I tie it in bundles and store it in a cool, dry place for curing for three weeks. Then I clean off the excess dirt, trim the roots and clip the bulbs, leaving about an inch of stem. Hardneck varieties will keep around six months while softnecks (best for braiding, due to their flexibility) keep up to a year. Any planting tips? : Plant in fertile (well composted) and well-draining soil about two clove lengths deep. Plant your biggest cloves for the best results and space by six inches. Mulch with 4 to 6 inches of weed-seed free straw and wait for spring (you can hit each plant at the base with fish emulsion in early June). What about harvesting? : When scapes (seedheads) begin to form on hardneck varieties, clip as they begin to curl around – this will channel the plant’s energy toward growing the bulb rather than producing seeds. Scapes are delicious and may be used like chives; they also make an excellent pesto.) Hardneck varieties are ready to pick when three-fifths of the foliage begins to turn golden brown. Softneck varieties are ready when they begin to fall over. I have never watered my garlic. Dan Sullivan raises children, chickens and garlic in southeast Pennsylvania. He is managing editor of BioCycle magazine and editor and founder of www.farmstory.org. You can find him on Twitter at GarlicDude or on YouTube at GarlicDanPA. 1. Choose a sunny spot. Garlic likes full sun, but will also grow in part shade. 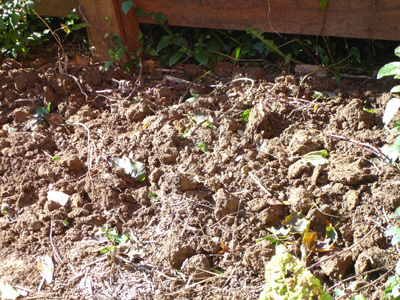 Turnover your soil and add some compost to get the ground ready for planting. 2. Get a digger. This is the tool you use to plant bulbs. 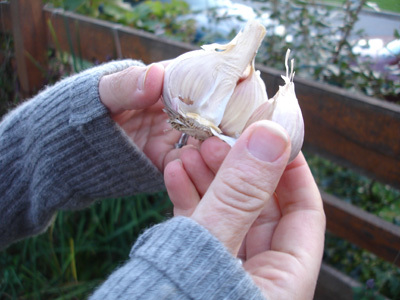 It makes it really easy for planting garlic cloves. 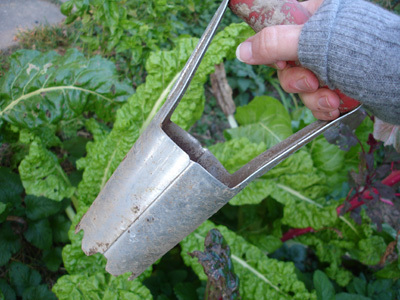 If you don't have one, you can use a small trowel instead. (But the digger is so much more fun). 3. Break apart your cloves. Each clove of garlic will magically grow into a full head. I know, amazing, right? Just break the garlic head up and get your cloves ready. 4. Make a bunch of holes in the ground. Since I don't have a lot of space, I plant my garlic pretty close together. 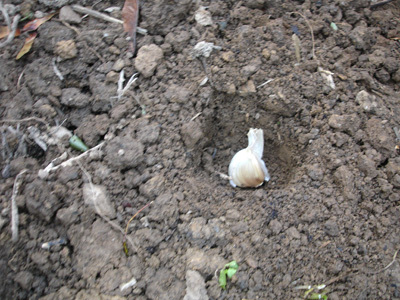 The standard is to plant it about 8 inches apart, and make the hole depth twice the size of the garlic cloves you are planting. I love planting garlic as a border for my garden, and it helps to deter pests (and prevent munching critters). 5. Place cloves in the ground. Make sure to put the pointy part up, since this is where the green shoot will come up. 6. 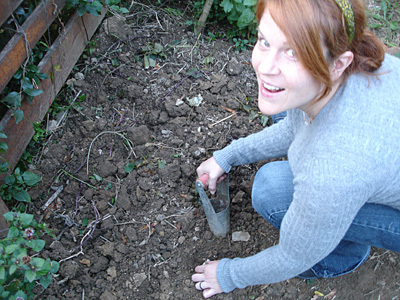 Then, cover up the hole with dirt, and apply a mulch of straw or leave before winter hits. Snow will fall, wind will blow, the ground will become frozen solid, but garlic toughs it out, and starts growing again in early spring, and will be ready for harvest around the fourth of July. Getting garlic: Want to plant garlic but didn't order in time? Try going to your local farmers market and either buy a few heads or ask if they'll sell you some planting stock. Look for larger cloves, and whatever you do, avoid that poor supermarket garlic (it's been treated with all sorts of anti-sprouting stuff). So, get planting, as long as it's in before the ground freezes, you're good to go!